1)In the Ethernet network, What method is used to access the media? 2)Which of the following Ethernet components is unique for each card created? 4)Which project 802 standard provides for a collision free protocol? 7)Which one is the least expensive that can support 100Mbps? Software Engineering is an engineering approach for software development.The basic principle of software engineering is to use structured, formal and disciplined methods for building and using systems.The outcome of software engineering is an efficient and reliable software product. Without using software engineering principles it would be difficult to develop large programs. In industry it is usually needed to develop large programs to accommodate multiple functions. A problem with developing such large commercial programs is that the complexity and difficulty levels of the programs increase exponentially with their sizes. Software engineering helps to reduce this programming complexity. Software engineering principles use two important techniques to reduce problem complexity: abstraction and decomposition. The principle of abstraction implies that a problem can be simplified by omitting irrelevant details. In other words, the main purpose of abstraction is to consider only those aspects of the problem that are relevant for certain purpose and suppress other aspects that are not relevant for the given purpose. Once the simpler problem is solved, then the omitted details can be taken into consideration to solve the next lower level abstraction, and so on. Abstraction is a powerful way of reducing the complexity of the problem. The other approach to tackle problem complexity is decomposition. In this technique, a complex problem is divided into several smaller problems and then the smaller problems are solved one by one. However, in this technique any random decomposition of a problem into smaller parts will not help. The problem has to be decomposed such that each component of the decomposed problem can be solved independently and then the solution of the different components can be combined to get the full solution. A good decomposition of a problem should minimize interactions among various components. It is obtained after excessive discussions with the users.Software requirement specification (SRS) is a document that completely describes what the proposed software should do without describing how software will do it.SRS is important and difficult task of a System Analyst. A software life cycle model is often referred to as a Software Development Life Cycle(SDLC).ISO/IEC 12207 is an international standard for software life-cycle processes. It aims to be the standard that defines all the tasks required for developing and maintaining software. The Waterfall Model was first Process Model to be introduced. The waterfall Model is a linear sequential flow. In which progress is seen as flowing steadily downwards (like a waterfall) through the phases of software implementation. This means that any phase in the development process begins only if the previous phase is complete. The waterfall approach does not define the process to go back to the previous phase to handle changes in requirement. 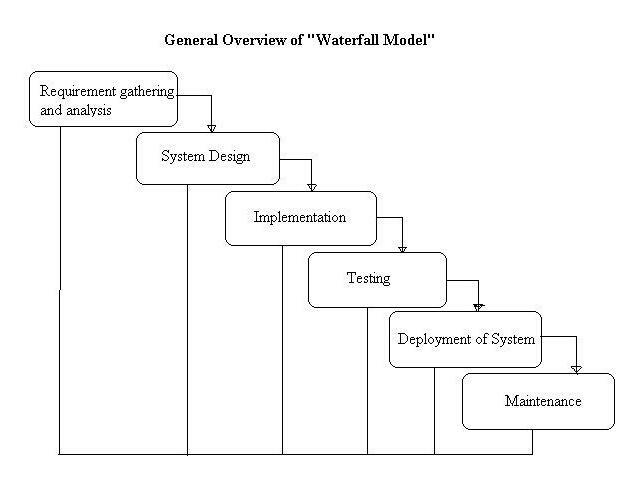 The waterfall approach is the earliest approach that was used for software development. Capture all the possible requirement of the system to be developed and documented in a software requirement. Helps in specifying hardware and system requirements and also helps in defining overall system architecture. With inputs from system design, the system is first developed in small programs called units, which are integrated in the next phase. Each unit is developed and tested for its functionality which is referred to as Unit Testing. All the units developed in the implementation phase are integrated into a system after testing of each unit. During this phase, each module is unit tested to determine the correct working of all the individual modules. It involves testing each module in isolation as this is the most efficient way to debug the errors identified at this stage. α – testing: It is the system testing performed by the development team. β –testing: It is the system testing performed by a friendly set of customers. Acceptance testing: It is the system testing performed by the customer himself after the product delivery to determine whether to accept or reject the delivered product. Once the functional and non functional testing is done, the product is deployed in the customer environment or released into the market. Correcting errors that were not discovered during the product development phase. This is called corrective maintenance. Improving the implementation of the system, and enhancing the functionalities of the system according to the customer’s requirements. This is called perfective maintenance. Porting the software to work in a new environment. For example, porting may be required to get the software to work on a new computer platform or with a new operating system. This is called adaptive maintenance. It is easy to manage due to the rigidity of the model – each phase has specific deliverables and a review process. Once an application is in the testing stage, it is very difficult to go back and change something that was not well-thought out in the concept stage. Not suitable for the projects where requirements are at a moderate to high risk of changing. This model is used only when the requirements are very well known, clear and fixed. Very less customer enter action is involved during the development of the product. Once the product is ready then only it can be demoed to the end users. Once the product is developed and if any failure occurs then the cost of fixing such issues are very high, because we need to update everywhere from document till the logic. 1)Which privilege is required to create a database? 2)Which Normal Form(NF) is considered adequate for normal relational database design? 3)A Foreign key in one table points to a ________ key in another table. 6)_______ is the process of organizing data into related tables. 7)Which of the following keyword can be used to return different values? 8)Which of the following field type is used to store photograph of employees? 9)Which of the following is standard interactive and programming language for getting information from and updating a database. 10)Which TCL command is used to permanently save any transaction into database? 1)The shared pool is also able to support ________ in data warehousing applications. 2)An important purpose of the shared pool is to cache the executable versions of _________ statements. 6)The ________ performs recovery when a failed instance starts up again. 7) Oracle 9i Reports gives us _______options for building a Web report. 8)Which of the following is an example for Embedded SQL Statement? 10)The ______ process is used for inter-instance locking in Real Application Clusters. A snapshot is a recent copy of a table from db or in some cases, a subset of rows/cols of a table. They are used to dynamically replicate the data between distributed databases. Snapshots can also contain a WHERE clause so that snapshot sites can contain customized data sets. Such snapshots can be helpful for regional offices or sales forces that do not require the complete corporate data set.When a snapshot is refreshed, Oracle must examine all of the changes to the master table to see if any apply to the snapshot. Therefore, if any changes where made to the master table since the last refresh, a snapshot refresh will take some time, even if the refresh does not apply any changes to the snapshot. If, however, no changes at all were made to the master table since the last refresh of a snapshot, the snapshot refresh should be very quick. Snapshot and materialized view are almost same same but with one difference. You can say that materialized view =snapshot + query rewrite functionality query rewrite functionality:In materialized view you can enable or disable query rewrite option. which means database server will rewrite the query so as to give high performance. Query rewrite is based on some rewritten standards(by oracle itself).So the database server will follow these standards and rewrite the query written in the materialized view ,but this functionality is not there in snapshots. It does not contain any DISTINCT or aggregation functions. It does not contain a GROUP BY or CONNECT BY clause. It does not perform set operations (UNION, UNION ALL, INTERSECT, etc.). It does not perform joins other than those used for subquery subsetting. Essentially, a simple snapshot is one that selects from a single table and that may or may not use a WHERE clause. Not surprisingly, any snapshot that is not a simple snapshot is a complex snapshot. Complex snapshots can only use COMPLETE refreshes, which are not always practical. For tables of more than about 100,000 rows, COMPLETE refreshes can be quite unwieldy.You can often avoid this situation by creating simple snapshots of individual tables at the master site and performing the offending query against the local snapshots. 10 Previous Year Questions of Computer Networks..